While most of us are happy to be rid of winter’s chill, spring and summer aren’t all sunshine and roses—severe weather often comes along with the warmer temps. Every thunderstorm produces lightning, which can strike as far away as 10-15 miles away from the storm. Lightening kills more people each year than tornadoes or hurricanes. Being inside doesn’t mean you are automatically safe from lightening. Even large and heavy vehicles such as SUVs and trucks can be swept away in flood waters. A highway/interstate overpass is not a safe place to take shelter if there’s a tornado. Even if you did know all of the above, don’t leave this post just yet—it’s important to refresh your memory about storm readiness. Once severe weather hits, you have to take the right steps to save your life and protect your property. Develop a family communication plan. If you and your loved ones are separated during severe weather, how will you reconnect? Here’s how to create a plan (including a link to a printable template). 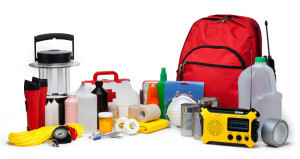 Ready.gov has a handy checklist to make shopping and gathering supplies easier. If you have pets, you’ll want to make a kit for them too—the ASPCA has a helpful list. Know the weather warning lingo. A watch means the conditions are right for severe weather to develop. At this stage it’s important to stay informed and be ready to act if a warning is issued. A warning means severe weather has been reported and there could be imminent danger to your life and property. Take action if a weather warning has been issued for your area. Follow the best practices for tornadoes, thunderstorms, flooding, and if there’s a hurricane. Buy a weather radio. These radios are designed to receive emergency alerts from the National Oceanic and Atmospheric Administration (NOAA) so you’re sure to never miss one (even if cell towers were taken out during a storm!). They cost as little as $18 at BestBuy for the basics, and more if you want some special features ( WeatherRadios.com has a buying guide which could be helpful). Do some tree trimming. High winds can cause trees and branches to fall and blow. Be sure to remove diseased or damaged limbs so they’re gone before the next storm. Batten down the hatches. Secure any loose items—including rain gutters and downspouts (and make sure they’re free of any clogs) to help prevent water damage to your property. Get surge protectors. There’s a big difference between a power strips and a surge protector. Learn the difference and get some shopping tips here. Backup your data. While of course you don’t want your machine to get fried by lightning, you also don’t want to add insult to injury and lose all your files too. Back up your computer frequently, or subscribe to a service such as TDS’ Backup Online so you’re sure to never lose photos, movies, and documents. Unplug your devices. While you should never touch electrical wires or cords during a storm, if there is severe weather in the forecast, the safest thing to do is pull the plug ahead of time. That’s the only way to just about guarantee a power surge won’t harm your devices.